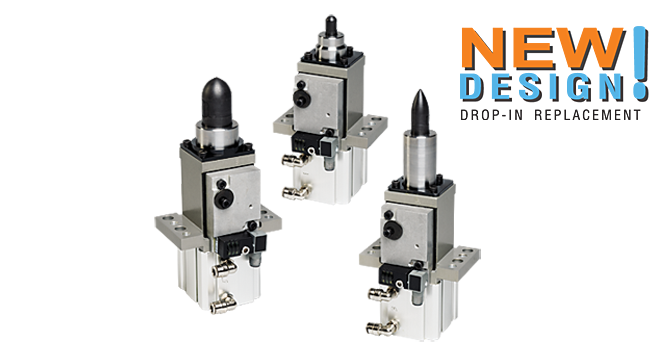 Pin Clamp | Versatile Pneumatic | PLK | PHD, Inc.
Series PLK Modular Pneumatic Pin Clamps feature high clamping force on a lightweight body, and are often used as the end effector of a robotic arm. As with the previous design, these clamps are designed with a completely enclosed pin and long life seals that can withstand the dirt and water present in shop air, but now are more versatile as we have increased the available pin diameters and now offer three different pin styles. Pin position sensing allows for open or closed sensing with an industry standard AC or DC weld field immune switch mounted in a protected housing. Series PLK Pin Clamps are ideal for part clamping applications in weld areas. Completely enclosed pin, lightweight, compact, built-in locking system, best delivery.